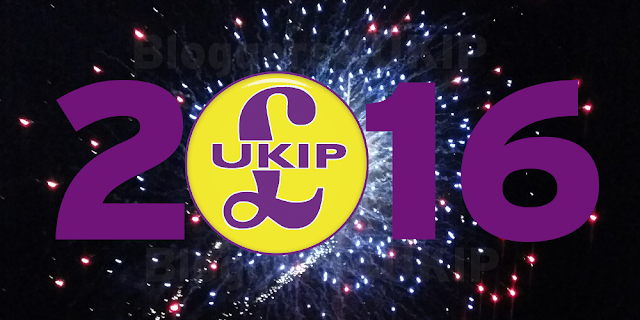 Well, 2015 has been a bit of a rollercoaster year for UKIP. We've seen the party gain over 3.9m votes and end up with just one MP, no new UKIP peers were created despite Cameron promising to make Lords match votes, the SNP routed Labour in Scotland, the Lib Dems were virtually wiped out, Nigel Farage resigned as leader for the second time and was convinced to "unresign" by the party's executive and the campaign to leave the EU started in earnest. 2016 promises to be an even more exciting year for UKIP with political pundits putting their money on the EU referendum being held in the next 12 months. With immigration racing out of control and the EU knocking back Cameron's "demands" for renegotiation it's looking unlikely but if 2016 does turn out to be the year we finally got a say on membership of an EU superstate then we're ready to hit the ground running!